Quack in the Box patients: who would YOU want to treat? Overview: Hey, want to make some quick money in the health care industry? It’s all about maximizing expensive (but possibly unnecessary) procedures without killing the patient … or, at least, without killing too many patients. 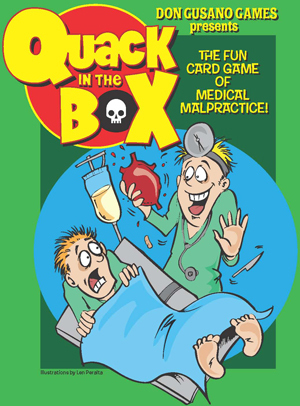 Quack in the Box is a wacky game of medical malpractice designed by an actual ER doc, with illustrations from the illustrious and industrious Len Peralta. Who Will Like It? Your opinion on this game may depend on whether you like morbid humor, and possibly on your opinion of our current health care industry. That is, if you think the current system is great and you’re a big fan of HMOs, Quack in the Box might be a little too snarky for your taste. On the other hand, if you (like much of the world) think health care costs are a bit out of control and you don’t mind being unprincipled in a game, you should give this a shot. Plus, if you actually work in health care, you’ll really appreciate the little details. Treatment cards: a little advice never hurt anyone … but it doesn't pay as well as abdominal surgery. Set aside your scruples, and don’t worry if you haven’t been to med school. In Quack in the Box, you’re all unscrupulous and incompetent anyway, treating your patients with “whatever medicines or surgeries happen to be available that day.” That whole “do no harm” thing? Yeah, you probably want to strike that for now. There’s a lot of dark humor throughout the game, from the cards to the illustrations to the rule sheet. For the medical novice, it’s a pretty funny game, but for those in the medical field, it’s really funny. Because it’s true. 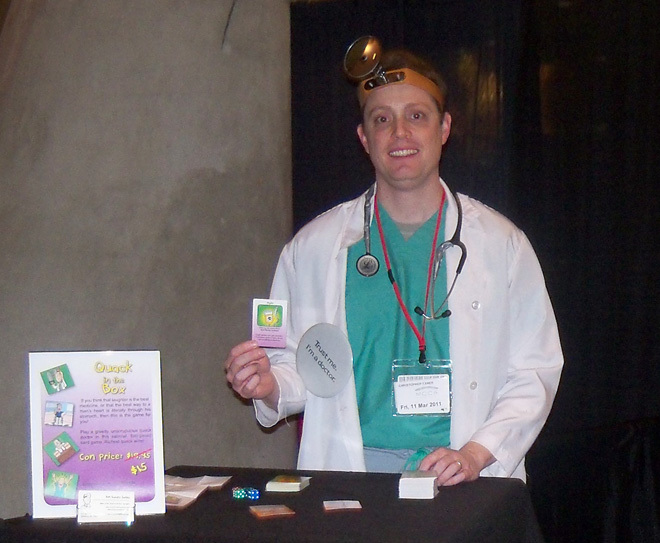 The game designer, Dr. Chris, is an ER doc in rural Pennsylvania (who would rather not have his full name turn up linked to the phrase “medical malpractice” in Google). He and his wife Clare run Don Gusano Games out of their basement, and the idea of the game came when Chris realized that the procedures and treatments actually earn money aren’t necessarily those that are most likely to help a patient get better. My wife, a family doctor, confirms this. It’s important to get a full medical history from a patient and to encourage them to quit smoking or exercise; these are things that are certainly helpful and won’t hurt anyone —but they also don’t get billed. Meanwhile, a CT scan isn’t always medically necessary, but it sure brings in the bucks. Quack in the Box reflects this reality. It’s exaggerated, but not necessarily by as much as you might think. The illustrations on the cards are by Len Peralta, of Geek-a-Week and 50 vs 50 fame, and they’re excellent. Some are pretty straightforward illustrations, such as a couple of pills or a hypodermic needle. But there are definitely those with some humor injected, often a bit over the top, like the “Exploratory Abdominal Surgery” seen above. It’s also worth noting that the instructions are pretty simple to read and have just enough humor to make it funny without dragging things out. There are simple diagrams detailing the parts of each card, and a turn sequence. There were only a few questions I had after reading the rules, but I’ll address those below. It’s a pretty bare-bones game and you’ll have to provide one six-sided die, plus some way to track things like money and infamy points. 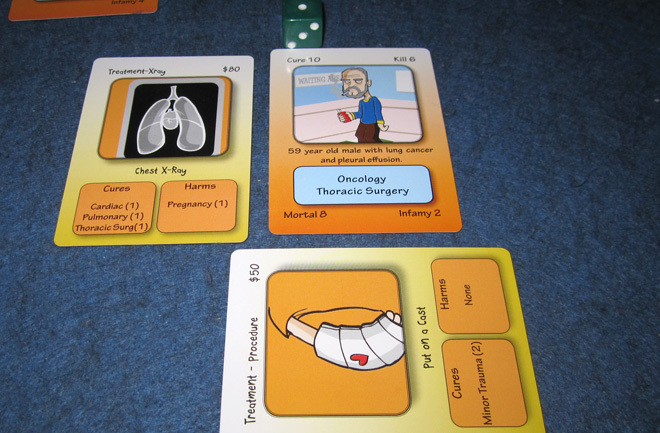 You could also use something to track how many Cure points and Harm points each patient has (I used extra dice). That said, I prefer a small game where I provide some of the parts to a card game that throws in just enough bits to require a huge box. All of the Patient cards are shuffled and placed in a deck face-down, and then the Treatment and Anytime cards are shuffled together to form the Doctor deck. Each player gets six Doctor cards. Decide on an Angry Mob Threshold — that is, the number of Infamy points you can accumulate before the Angry Mob comes after you. The rules recommend something between 6 and 12, depending on the length you’d like for your game. 1. Flee the country? Before your turn starts, you can flee to Switzerland, “staying one step ahead of the pitchfork-wielding mob.” Once you flee the country, that’s it for you — you won’t get any more infamy points, but you also can’t make any more money, though you can still continue to play Anytime cards on the other doctors. 4. Roll for required treatments. Roll the die to find out how many Treatments you must play this turn. You need a number between 2 and 5, so if you roll a 1 or 6, re-roll. (Or get yourself a 4-sided die and add 1 to the result.) This indicates how many Treatment cards you must play this round; if you don’t have that many, you must play all the ones you have and then play or discard one Anytime card. 5. Treat the Patient. Play your Treatment cards in any order. When you play cards, you place them next to your Patient card according to whether they Cure or Harm your patient (or both or neither). Each Treatment has a list of illnesses that they Cure or Harm and how many points they do. If you reach the number of Cure or Kill points shown on the card, then you can stop playing treatments — you’ve done enough here, doc. In addition, some patients have a “Mortal” number listed in the bottom left corner. This indicates the number of treatments they can receive before they die. 6. Angry Mob phase. If your Infamy point reaches or exceeds the Angry Mob Threshold, you’re out of the game. Too bad. When all but 2 players have fled the country or have been eliminated, each remaining player gets one more turn. The player with the most money (who hasn’t been run out by the Angry Mob) is the winner. The rules didn’t specify what you do in the case of a 2-player game (because it wouldn’t make sense for each of you to only have one turn), but when I asked they said in that case you just play until somebody has succumbed to the Angry Mob or both have decided to flee to Switzerland. Anytime cards: slap your opponents with lawsuits, uncooperative HMOs, new diagnoses, and more! Quack in the Box is a really interesting game, though perhaps not necessarily as much for its gameplay as its take on the subject matter. The strategy is pretty light and there’s a high luck factor both in the cards you draw and the die rolls. Some of the games I’ve played have ended up with wild discrepancies in scores because of the patients and treatments we had on hand. The treatment cards are pretty well done, though, with a good balance of Cure and Harm points with the amount you get paid. In terms of gameplay, it’s about on the same level as the Munchkin games, with similar amounts of luck and strategy and screw-your-neighbor tactics. Overall, I think Quack in the Box is an excellent, light-strategy game with a morbidly funny theme. It won’t provide very deep gameplay, but you’ll laugh (and cringe) a lot while you’re playing it. I’d recommend it particularly for those in the medical field, but also to anyone looking for a silly, light-hearted Munchkin-esque game.